L P Hunt,	The Journal of Laryngology & Otology, Volume 120 Issue 2, pp 85-86. W Maier, J Schipper,	The Journal of Laryngology & Otology, Volume 120 Issue 8, pp 613-618. I Akin, G Kuran, C Saka, M Vural,	The Journal of Laryngology & Otology, Volume 120 Issue 4, pp 261-265. The Journal of Laryngology & Otology, Volume 120 Issue 5, pp 361-362. Nicola Jacobsen, Robert Mills,	The Journal of Laryngology & Otology, Volume 120 Issue 4, pp 266-271. Assessment of expressive vocabulary outcomes in hearing-impaired children with hearing aids: do bilaterally hearing-impaired children catch up? C Kiese-Himmel, M Reeh,	The Journal of Laryngology & Otology, Volume 120 Issue 8, pp 619-626. J Xenellis, I Karapatsas, N Papadimitriou, T Nikolopoulos, P Maragoudakis, M Tzagkaroulakis, E Ferekidis,	The Journal of Laryngology & Otology, Volume 120 Issue 9, pp 718-724. Did Ludwig's angina kill Ludwig? J Wasson, C Hopkins, D Bowdler,	The Journal of Laryngology & Otology, Volume 120 Issue 5, pp 363-365. M Pitchers, A Stokes, R Lonsdale, D J Premachandra, D R Edwards,	The Journal of Laryngology & Otology, Volume 120 Issue 6, pp 433-438. Tarek Khrais, Mario Sanna,	The Journal of Laryngology & Otology, Volume 120 Issue 5, pp 366-370. Routine nasopharyngeal biopsy in adults presenting with isolated serous otitis media: is it justified? F Glynn, I J Keogh, T Abou Ali, C I Timon, M Donnelly,	The Journal of Laryngology & Otology, Volume 120 Issue 6, pp 439-441. David M Baguley, Rachel L Humphriss, Katy Butler, Richard Knight, Lisa Dawson, Fiona Vickers, Alice Mitchell,	The Journal of Laryngology & Otology, Volume 120 Issue 4, pp 272-275. L Jovanovic-Bateman, R Hedreville,	The Journal of Laryngology & Otology, Volume 120 Issue 8, pp 627-630. P Spielmann, R Mills,	The Journal of Laryngology & Otology, Volume 120 Issue 9, pp 725-729. I Hocevar-Boltezar, A Jarc, V Kozelj,	The Journal of Laryngology & Otology, Volume 120 Issue 4, pp 276-281. Sean Flanagan, Payal Mukherjee, John Tonkin,	The Journal of Laryngology & Otology, Volume 120 Issue 2, pp 98-102. G Aydemir, M S Tezer, P Borman, H Bodur, A Unal,	The Journal of Laryngology & Otology, Volume 120 Issue 6, pp 442-445. W K Smith, D Sandooram, P R Prinsley,	The Journal of Laryngology & Otology, Volume 120 Issue 9, pp 730-735. D Moffat, R De, D Hardy, I Moumoulidis,	The Journal of Laryngology & Otology, Volume 120 Issue 8, pp 631-637. D W Aird, P Puttasiddaiah, S Berry, C Spyridakou, M Kumar,	The Journal of Laryngology & Otology, Volume 120 Issue 5, pp 371-374. Does the slow compression technique of hyperbaric oxygen therapy decrease the incidence of middle-ear barotrauma? D Vahidova, P Sen, M Papesch, M P Zein-Sanchez, P H J Mueller,	The Journal of Laryngology & Otology, Volume 120 Issue 6, pp 446-449. M Al-Qudah, P J D Dawes,	The Journal of Laryngology & Otology, Volume 120 Issue 9, pp 736-739. Sule Yilmaz, Ahmet Rifat Karasalihoglu, Abdullah Tas, Recep Yagiz, Memduha Tas,	The Journal of Laryngology & Otology, Volume 120 Issue 2, pp 103-107. A Pandey, D R Ingrams, M Jones, R Raman, N D Marks,	The Journal of Laryngology & Otology, Volume 120 Issue 5, pp 375-377. H Harada, M Tanaka, T Kato,	The Journal of Laryngology & Otology, Volume 120 Issue 8, pp 638-643. Gürsel Dursun, M Kürşat Gökcan,	The Journal of Laryngology & Otology, Volume 120 Issue 4, pp 282-288. D D Pothier, C Bredenkamp,	The Journal of Laryngology & Otology, Volume 120 Issue 5, pp 378-380. N C Saunders, R Malhotra, N Biggs, P A Fagan,	The Journal of Laryngology & Otology, Volume 120 Issue 9, pp 740-744. S M Hashmi, D J Premachandra, A M D Bennett, W Parry,	The Journal of Laryngology & Otology, Volume 120 Issue 8, pp 644-649. E Ofo, A Singh, J Marais,	The Journal of Laryngology & Otology, Volume 120 Issue 2, pp 108-112. K Haddow, M-L Montague, S S M Hussain,	The Journal of Laryngology & Otology, Volume 120 Issue 6, pp 450-454. E Babin, V Rouleau, P O Vedrine, B Toussaint, D de Raucourt, O Malard, A Cosmidis, M Makaeieff, D Dehesdin,	The Journal of Laryngology & Otology, Volume 120 Issue 4, pp 289-297. Ear protection as a treatment for disruptive snoring: do ear plugs really work? S Robertson, S Loughran, K MacKenzie,	The Journal of Laryngology & Otology, Volume 120 Issue 5, pp 381-384. M van der Torn, C D L van Gogh, I M Verdonck-de Leeuw, J M Festen, H F Mahieu,	The Journal of Laryngology & Otology, Volume 120 Issue 6, pp 455-462. D Andreadis, A Epivatianos, G Mireas, A Nomikos, A Poulopoulos, J Yiotakis, C Barbatis,	The Journal of Laryngology & Otology, Volume 120 Issue 4, pp 298-304. Henry Chuen Kwong Lam, John Ka Keung Sung, Victor James Abdullah, Charles Andrew van Hasselt,	The Journal of Laryngology & Otology, Volume 120 Issue 2, pp 113-116. H-T Lin, C-S S Tsai, Y-L Chen, J-G Liang,	The Journal of Laryngology & Otology, Volume 120 Issue 8, pp 650-654. A Safdar, S Gendy, A Hilal, P Walshe, H Burns,	The Journal of Laryngology & Otology, Volume 120 Issue 9, pp 745-748. K P Pang,	The Journal of Laryngology & Otology, Volume 120 Issue 8, pp 655-660. F Vaz, L Ripley, D Lim, R Kanegaonkar, M Harries,	The Journal of Laryngology & Otology, Volume 120 Issue 5, pp 385-388. Satisfaction with cosmesis following nasal manipulation: do previous fractures matter? M Supriya, W A Clement, F Ahsan, A J Cain,	The Journal of Laryngology & Otology, Volume 120 Issue 9, pp 749-752. Andreas M Sesterhenn, Joanna Iwinska-Zelder, Carsten V Dalchow, Siegfried Bien, Jochen A Werner,	The Journal of Laryngology & Otology, Volume 120 Issue 2, pp 117-124. I K Rustom, A Jebreel, M Tayyab, R J A England, N D Stafford,	The Journal of Laryngology & Otology, Volume 120 Issue 6, pp 463-466. Cheng-Ping Wang, Jenq-Yuh Ko, Pei-Jen Lou,	The Journal of Laryngology & Otology, Volume 120 Issue 4, pp 305-309. C Timon, K Reilly,	The Journal of Laryngology & Otology, Volume 120 Issue 5, pp 389-392. M A Hafidh, P Sheahan, I Keogh, R McConn Walsh,	The Journal of Laryngology & Otology, Volume 120 Issue 4, pp 310-313. Neil K Chadha, Costa Repanos,	The Journal of Laryngology & Otology, Volume 120 Issue 2, pp 125-128. W Zhibin, J Min,	The Journal of Laryngology & Otology, Volume 120 Issue 9, pp 753-758. Y Bajaj, M De, A Thompson,	The Journal of Laryngology & Otology, Volume 120 Issue 6, pp 467-469. J Basterra, E Zapater, R Moreno, R Hernández,	The Journal of Laryngology & Otology, Volume 120 Issue 8, pp 661-664. T Mackle, T O'Dwyer,	The Journal of Laryngology & Otology, Volume 120 Issue 5, pp 393-396. Mehmet F Oktay, Ismail Topcu, Abdurrahman Senyigit, Aslan Bilici, Adem Arslan, Sebahattin Cureoglu, Muzeyyen Yildirim,	The Journal of Laryngology & Otology, Volume 120 Issue 2, pp 129-132. K Sato, T Nakashima,	The Journal of Laryngology & Otology, Volume 120 Issue 9, pp 759-763. O A Albirmawy, M N Elsheikh, M E Saafan, E Elsheikh,	The Journal of Laryngology & Otology, Volume 120 Issue 6, pp 470-477. M-L Montague, S S M Hussain,	The Journal of Laryngology & Otology, Volume 120 Issue 4, pp 314-318. B Satar, Y Hidir, S Yetiser,	The Journal of Laryngology & Otology, Volume 120 Issue 8, pp 665-669. Alexander C Vlantis, Brian K H Yu, Raymond K Y Tsang, Michael K M Kam, Phoebe S Y Lo, C Andrew van Hasselt,	The Journal of Laryngology & Otology, Volume 120 Issue 5, pp 397-404. J R Tysome, N D Padgham,	The Journal of Laryngology & Otology, Volume 120 Issue 8, pp 670-675. Early supraglottic cancer: how extensive must surgical resection be, if used alone? A A Dünne, R K Davis, C V Dalchow, A M Sesterhenn, J A Werner,	The Journal of Laryngology & Otology, Volume 120 Issue 9, pp 764-769. T Taguchi, M Tsukuda, Y Mikami, C Horiuchi, J-I Ishitoya, H Katori,	The Journal of Laryngology & Otology, Volume 120 Issue 6, pp 478-481. J Doshi, S Carrie,	The Journal of Laryngology & Otology, Volume 120 Issue 9, pp 770-773. S Özbilen, U Aydil, A E Dinç, Y Kizil, A Köybaşioğlu,	The Journal of Laryngology & Otology, Volume 120 Issue 6, pp 482-486. R W Ridley, J B Zwischenberger,	The Journal of Laryngology & Otology, Volume 120 Issue 8, pp 676-680. Hersad M Vaghela, Gareth Jones, Andrew A Moir,	The Journal of Laryngology & Otology, Volume 120 Issue 5, pp 405-407. N Calder, C MacAndie, F MacGregor,	The Journal of Laryngology & Otology, Volume 120 Issue 6, pp 487-491. Erdem Atalay Cetinkaya, Cinemre Okan, Kesapli Pelin,	The Journal of Laryngology & Otology, Volume 120 Issue 4, pp 325-326. J K Sahni, S Kumar, V Wadhwa, G Kathuria,	The Journal of Laryngology & Otology, Volume 120 Issue 5, pp 408-410. A Ateşpare, G Keskin, C Erçin, S Keskin, A Camcıoğlu,	The Journal of Laryngology & Otology, Volume 120 Issue 8, pp 681-683. K G Effat,	The Journal of Laryngology & Otology, Volume 120 Issue 5, pp 411-413. Min-Tsan Shu, Hung-Ching Lin, Cheng-Chien Yang, Kuo-Ming Chang,	The Journal of Laryngology & Otology, Volume 120 Issue 8, pp 684-686. D Z Antoniades, A K Markopoulos, E Deligianni, D Andreadis,	The Journal of Laryngology & Otology, Volume 120 Issue 4, pp 327-329. J Ahmed, P Chatrath, J Harcourt,	The Journal of Laryngology & Otology, Volume 120 Issue 5, pp 414-415. D A Chaukar, A Pai, A K D'Cruz,	The Journal of Laryngology & Otology, Volume 120 Issue 6, pp 494-496. I Tyagi, A Goyal, R Syal, S K Agarwal, P Tewari,	The Journal of Laryngology & Otology, Volume 120 Issue 8, pp 687-690. Kazuaki Chikamatsu, Masato Shino, Yoichiro Fukuda, Koichi Sakakura, Nobuhiko Furuya,	The Journal of Laryngology & Otology, Volume 120 Issue 4, pp 330-333. 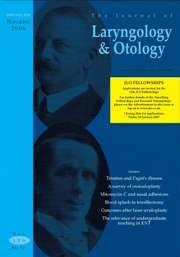 T Price, J Pickles,	The Journal of Laryngology & Otology, Volume 120 Issue 4, pp 334-337. D J McCrystal, C Bond,	The Journal of Laryngology & Otology, Volume 120 Issue 6, pp 497-501. A Sil, P Chatrath, D J Gatland,	The Journal of Laryngology & Otology, Volume 120 Issue 5, pp 416-418. M F Oktay, I Topcu, A McKinney, V Turunz, O Aras,	The Journal of Laryngology & Otology, Volume 120 Issue 8, pp 691-693. S Basu, N Nair, T Shet, A M Borges,	The Journal of Laryngology & Otology, Volume 120 Issue 4, pp 338-342. C Jones, T M Siva, F K Seymour, B J O'Reilly,	The Journal of Laryngology & Otology, Volume 120 Issue 6, pp 502-504. S J Broomfield, I A Bruce, D A Luff, A R Birzgalis, R J Ashleigh,	The Journal of Laryngology & Otology, Volume 120 Issue 8, pp 694-697. M Karlberg, M Annertz, M Magnusson,	The Journal of Laryngology & Otology, Volume 120 Issue 5, pp 419-422. Y H Choung, K Park, C H Kim, H J Kim, K Kim,	The Journal of Laryngology & Otology, Volume 120 Issue 4, pp 343-352. The Journal of Laryngology & Otology, Volume 120 Issue 5, p 423. J-C Lee, B-J Lee, S-G Wang, H-W Kim,	The Journal of Laryngology & Otology, Volume 120 Issue 6, pp 505-507. M S Thevasagayam, K Willson, C Jennings, P Pracy,	The Journal of Laryngology & Otology, Volume 120 Issue 8, pp 698-701. B C Hanna, T G Delap, K Scott, S Sinclair,	The Journal of Laryngology & Otology, Volume 120 Issue 8, pp 702-704. J T F Postelmans, R J Stokroos,	The Journal of Laryngology & Otology, Volume 120 Issue 6, pp 508-510. S Islam, C V Cole, G R Hoffman, P A Brennan,	The Journal of Laryngology & Otology, Volume 120 Issue 4, pp 353-355. J R Tysome, A Sandison, P M Clarke,	The Journal of Laryngology & Otology, Volume 120 Issue 6, pp 511-513. D D Pothier, N Charaklias,	The Journal of Laryngology & Otology, Volume 120 Issue 9, pp 1-3. Livio Presutti, Domenico Villari, Daniele Marchioni,	The Journal of Laryngology & Otology, Volume 120 Issue 6, pp 1-3. C A Lee, D Mistry, R Sharma, A P Coatesworth,	The Journal of Laryngology & Otology, Volume 120 Issue 2, pp 1-10. Adenike Folake Oluwasanmi, Martin Robert Thornton, Hisham Saleh Khalil, Paul Anthony Tierney,	The Journal of Laryngology & Otology, Volume 120 Issue 2, pp 1-5. R Aggarwal, S R Saeed, K J M Green,	The Journal of Laryngology & Otology, Volume 120 Issue 6, pp 429-432. I J Nixon, B J G Bingham,	The Journal of Laryngology & Otology, Volume 120 Issue 9, pp 713-717. Neck dissection: past, present and future? Alfio Ferlito, Alessandra Rinaldo, K Thomas Robbins, Carl E Silver,	The Journal of Laryngology & Otology, Volume 120 Issue 2, pp 87-92. S H Liyanage, A Singh, P Savundra, A Kalan,	The Journal of Laryngology & Otology, Volume 120 Issue 2, pp 93-97. E R M Carr, E Benjamin,	The Journal of Laryngology & Otology, Volume 120 Issue 2, pp 133-134. M Kumar, P Puttasiddaiah,	The Journal of Laryngology & Otology, Volume 120 Issue 4, pp 319-321. S H Liyanage, S Khemani, S Lloyd, R Farrell,	The Journal of Laryngology & Otology, Volume 120 Issue 4, pp 322-324. The Journal of Laryngology & Otology, Volume 120 Issue 2, pp 160-161. The Journal of Laryngology & Otology, Volume 120 Issue 4, p 356. The Journal of Laryngology & Otology, Volume 120 Issue 8, pp 708-709. The Journal of Laryngology & Otology, Volume 120 Issue 6, p 514. The Journal of Laryngology & Otology, Volume 120 Issue 5, pp 426-428. The Journal of Laryngology & Otology, Volume 120 Issue 4, pp 357-359. The Journal of Laryngology & Otology, Volume 120 Issue 2, pp 163-168. The Journal of Laryngology & Otology, Volume 120 Issue 6, pp 517-519. The Journal of Laryngology & Otology, Volume 120 Issue 8, pp 711-712. The Journal of Laryngology & Otology, Volume 120 Issue 9, pp 803-804.